Rowing in Paris is not as romantic as it sounds. I spent the morning on the Seine in a 4-, but after that the romance ends and other realities set in. 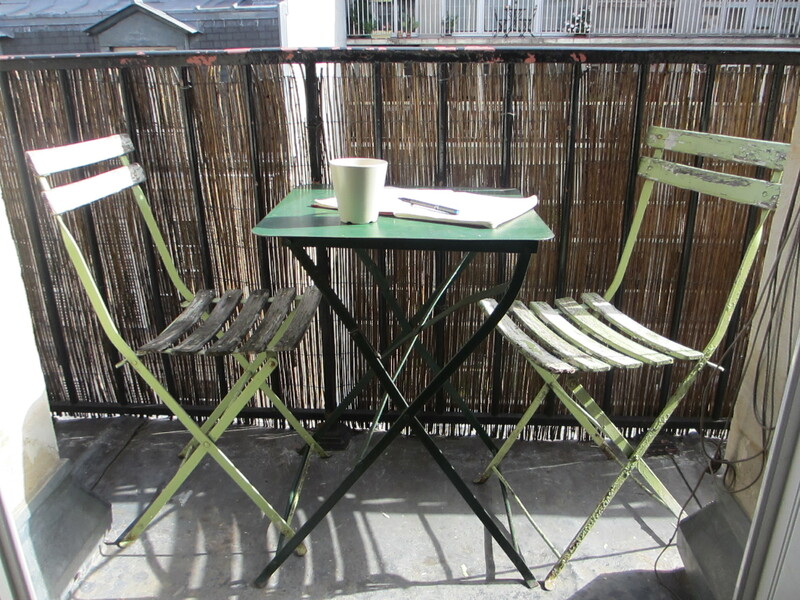 I am writing this post on perhaps the tiniest balcony known to man, just enough room to wedge an iron table and two little folding chairs out the window. It’s the middle of Sunday afternoon and I am soaking up the sun and resting with a lovely cup of coffee after a nice morning row, and enjoying the sounds of Parisians going about their business on the street five floors below me. My family is out there somewhere in the wide world of Paris, but I can’t figure out where, so I’m taking this time to recap my row before it gets lost in the barrage of sights, sounds and smells that is Paris. I had a pretty good idea where I was headed when I set off for the metro this morning, having taken the subway into the city last night as a family, packed like sardines into a train full of White Night revelers pouring into the city along with us. I took the train north this time, away from the tourists, off the maps printed in our guidebooks. I found my bus at Porte de Clignancourt and saw the city get grimier with every passing block. Here was intense poverty, where street vendors with tables and tents gave way to men showing their paltry goods on blankets on the hard ground, and raggedy men poking through them. From there we passed signs for a large industrial park, then we crossed the bridge onto Ile St. Denis, and I knew it was time to disembark. The bus driver questioned my choice of stops, but let me go with a kind though worried sort of smile, and I headed off toward the water in my quest for the St. Denis Rowing Club. Descend I did to the basement of this grey concrete building, where a warehouse of Filippi singles and other boats stretched as far as the eye could see. The organizer seemed to think I preferred to sweep, so he put me in a straight four with three young women who seemed disappointed not to be sculling. I scull too! I wanted to say, but didn’t have quite the words or presence of mind to explain. I was assigned to bow, but I wasn’t bowing; oddly, the foot steering was attached to three seat’s stretchers. The coach’s launch was made of plastic; rowers rolled it out to a hoist, attached it to some chains, and lowered it via remote control to the water. Never seen THAT before! If German rowers like their steady state rows, then the French like their drills, at least in my limited experience. We did a lot of square blade rowing, then a variety of pic drills, first stern pair, then bow pair, normal enough, but it continued with the middle pair, then 1 and 4 seat together. There was extensive coaching from within the boat for the beleaguered 2 seat, and there was much discussion of my bladework among the stroke pair but no comment offered to me. No comment either from the man in the launch who hovered nearby with a bemused look on his face. We were on a stretch of the Seine in the northern suburbs, and houseboats and other mid-sized craft lined both sides of the waterway for miles without break. Thankfully none of them were making their way down the river, as it was fairly narrow and the wake would have been terrible. The only wildlife I spotted was a black rat running along the quai. I said farewell to my new rowing friends without much fanfare and headed to the bus stop. A rower I recognized arrived a few minutes later, and said the bus would be a while yet, so she encouraged me to walk with her a half mile or so to the next bus stop to catch a bus that runs more frequently. We talked a bit in French and English and Franglais, and I felt the difficulty of trying to use my French after 25 years of dormancy. Though there was a time when I was immersed enough to dream in French, those days are a distant memory, and my vocabulary has shrunk to an alarmingly small size with significant gaps. At the bus stop my new friend embraced me and gave me the classic two-kiss farewell, surprising me as we had not even exchanged our names. Adieu it was, and I found the bus right where she told me it would be, and saw the neighborhood now from a new angle, where a shanty town of vendors offered faded Persian rugs, antiquities and modest household goods that stretched for many blocks before we returned to more recognizable territory. The sun has gone behind a cloud and the afternoon is slipping away, so I am off to find my family and corral them to an old friend’s apartment somewhere in the shadow of the Notre Dame. Can’t wait. This entry was posted in City life, Rowing and tagged Paris, Rowing, St Denis on October 6, 2013 by Jill M.. The opening of your post reminds me of the Urban Raft! It’s a total Urban Raft!